As Veterans Day draws near, the Give Back Yoga Foundation is inviting the public to support the long-term health and wellbeing of those who serve the U.S. through a “Buy One, Give One” campaign that will bring free copies of the newly released book “Yoga For Warriors” to veterans and military service members worldwide. Today, an increasing number of United States veterans who struggle with post-deployment issues such as Post-Traumatic Stress Disorder (PTSD), brain injury, sexual trauma and marital difficulties are using yoga to deal with physical and invisible wounds. The Give Back Yoga Foundation is strongly committed to sponsoring yoga programs and resources that support our veterans, providing tools to help them transition back to civilian life and reconnect with themselves, friends, and families. This Boulder-based national non-profit offers a gateway to yoga service trainings, resources and partnerships to support at-risk teens, veterans, prisoners, and those struggling with disordered eating and negative body image. The latest resource to be sponsored through the organization is Yoga For Warriors, a new book released in October 2014 by publishing company Sounds True. Written by Give Back Yoga co-founder Beryl Bender Birch, Yoga For Warriors contains numerous tools to help individuals suffering from PTSD find inner calm and serenity. The specialized techniques featured in the book were developed by the author through her work with first responders in the aftermath of the 9/11 attacks, and chosen for their immediate usefulness in offering current and former military personnel a method of finding strength and relaxation even in the most difficult of circumstances. Through December 31, 2014, for every copy of Yoga For Warriors purchased through the Give Back Yoga Foundation, the organization will gift a free matching copy to a veteran or active duty service member. By buying a copy of the book for themselves or a veteran they know and love, supporters can put this valuable resource in the hands of a warrior who can benefit – doubling the impact of this valuable practice guide. The campaign is made possible through the generous financial support of private donors and socially responsible corporations like ORGANIC INDIA and WhiteWave Foods, who are helping to underwrite the printing costs of bringing free copies of Yoga For Warriors to veterans and military personnel. For more information on how to support the Give Back Yoga Foundation’s “Buy One, Give One” Campaign for veterans this Veterans Day and holiday season, please visit their website at: http://givebackyoga.org/yoga-for-warriors-campaign. Those who choose to serve their country in the military honor themselves and their communities, but often return from their service with ongoing challenges to their physical and mental wellbeing. Post Traumatic Stress Disorder, commonly referred to by its acronym PTSD, is an all too common condition facing military personnel and veterans. Yoga For Warriors contains numerous tools for individuals suffering from PTSD that will help them find inner calm and serenity through various exercises and meditation. Adapting to civilian life after military service can be a difficult transition. Warriors do not stop being warriors simply because they leave the battlefield. The necessary austerity of serving in the armed forces will be with veterans for their entire lives. Yoga for Warriors can help service members to stretch their bodies and their minds by harnessing their well-honed discipline to their advantage. By focusing their martial instincts toward improving their mental well being, Yoga for Warriors seeks to promote healthy adaptation into civilian life. Meditation, breathing exercises, and yoga postures might not be the first thing an instructor covered during basic, but it can be a helpful addition to anyone’s daily PT. Yoga for Warriors will be an excellent addition to any serious yoga practitioner’s bookshelf. While the book is available through Sounds True, the multimedia publishing company behind Yoga for Warriors, the special initiative by the Give Back Yoga Foundation in November and December 2014 centers around the concept that when someone buys the book through Give Back Yoga Foundation, a free copy will be donated to a vet or service member, giving them a tool to manage traumatic stress. The Give Back Yoga Foundation is a national non profit yoga organization that helps certified yoga teachers to share the extraordinary gift of yoga therapy with the underserved corners of their communities. Learn more about the yoga initiatives of Give Back Yoga Foundation on their website at http://givebackyoga.org. The Give Back Yoga Foundation extends its thanks to the web marketing team at Ramblin Jackson for donating their time to create this press release about our mission of sharing free copies of Yoga For Warriors with veterans and service members everywhere. Find them on the web at: http://www.ramblinjackson.com/. Jon Greuel: When Will the Joint Chiefs Practice Yoga? How can yoga and meditation support the treatment of post-traumatic stress? Executive Director Rob Schware talks with Jon Greuel, co-founder of Humanity Moves, about this topic in the latest interview for our yoga service series on The Huffington Post. To learn more about Jon’s work with veterans with PTSD and his thoughts on the benefits of introducing yoga and meditation to basic training, read his full interview on The Huffington Post Blog. Did you know we offer free yoga and mindfulness resources for veterans and active duty service members? Help us to reach 30,000 vets by 2015 by sharing our Resources for Veterans page. https://givebackyoga.org/wp-content/uploads/2014/04/Jon-Greuel.png 224 313 Grace Miller https://givebackyoga.org/wp-content/uploads/2019/04/givebacklogo-2019.png Grace Miller2014-04-24 16:26:102014-09-08 10:43:31Jon Greuel: When Will the Joint Chiefs Practice Yoga? We’re grateful for the partnership of Call and Response Foundation, a registered non-profit that helps communities, prison inmates and youth to find peace and healing through chanting. By bringing partner artists to over 20 outreach sites across the US – including prisons, psychiatric hospitals, schools and institutions – Call and Response is sharing the transformational experience of devotional chanting with those who can benefit. Call and Response is now working with Give Back Yoga to introduce sacred sound to yoga classes for underserved populations, both by donating CDs to our programs and by connecting teachers with partner musicians. Conscious music and chanting can provide a myriad of health benefits, says Dr. Kanimozhi, an assistant professor of yoga at the Chennai Research Center in India. Call and Response Foundation is also helping Give Back Yoga to spread the word about Mindful Yoga Therapy toolkits and Prison Yoga training guides which introduce veterans, military families and prisoners to the benefits of yoga and meditation. Lisa Mase, Outreach Director for Call and Response Foundation, says that this partnership is a way to support the shared mission of bringing healing practices to under-resourced populations. “It feels like our two organizations are parts of a greater whole that brings yoga, mindfulness, and sacred sound to those who can most benefit,” says Mase. Call and Response Foundation’s partner musicians generously offer educational materials and free music through the foundation’s online library. Learn more about the sound and spirit of sacred chant by exploring Call and Response Foundation’s free music, essays, mantras, videos, and more. Musicians who partner with the Call and Response Foundation take time out of their tours to offer conscious music in prisons, psychiatric facilities, universities, at-risk youth groups, and music therapy programs. The Foundation offers musicians a stipend to do this work. These funds come purely from donation of those who believe in the healing power of conscious music. Please consider supporting the Foundation – every donation counts! I’m having difficulties making sense of war. For Americans, at least, the war in Iraq is over. But only in a way, politically — not in the human sense of lives changed. I recently returned from visiting San Quentin State Prison through an invitation from Prison Yoga Project founder and director James Fox. It was Thursday morning; the yoga and yoga nidra class was for incarcerated veterans. An alarming 10% of the inmate population at San Quentin are veterans. Ron Self at San Quentin State Prison. Courtesy of Saalik Khan and Veterans Healing Veterans. Helping me to make sense of the unintelligible on this journey was my current reading: Phil Klay’s new book Redeployment (Penguin Press), twelve stories by a Marine who served in Iraq that show the experience of wartime in a foreign country, and what war can do to people’s souls. But while the human toll is great, there are also some rays of light in the darkness: while at San Quentin, I was honored to meet Veterans Healing Veterans from the Inside Out President and Founder Ron Self, whom I had interviewed in my Huffington Post blog series. Veterans Healing Veterans brings incarcerated and free veterans together for mutual support and healing from post-traumatic stress, helping them to make a successful transition back into society whether they’re returning from combat or from prison. With a brand new website and a new Executive Director, Mary Donovan, Veterans Healing Veterans is poised to make a real difference, working at the intersection of the military and the criminal justice system to heal wounds that can result in suicide and incarceration among our nation’s warriors. Give Back Yoga also supports veterans’ healing journey by sharing free copies of the Mindful Yoga Therapy toolkit with vets, active duty service members and their families. Designed with the feedback of veterans who are coping with post-traumatic stress, this toolkit is a valuable resource for anyone touched by trauma who wishes to explore the healing power of yoga and meditation. Will you join us in helping veterans to heal? When you purchase your own copy of the Mindful Yoga Therapy toolkit, you’ll fund five free toolkits for vets. Or make a directed donation to Yoga for Veterans – for every $5 contributed, we can reach one more veteran with this simple but effective tool. Your support will have an impact on the life of a veteran…long after the fighting has ended. Experiencing the gifts of yoga can inspire the desire to share this valuable tool with the world. Here, Executive Director Rob Schware talks with teacher Sumr Breez for The Huffington Post Blog about what motivates her to bring yoga to veterans. Read Sumr’s full interview to learn how service has changed her definition of yoga, and her advice for teachers who want to serve veterans. This interview is one of 26 blog posts featured in Give Back Yoga Foundation’s new publication, Yoga: How We Serve, a collection of conversations with teachers who work with veterans, active duty service members and their families. Enjoy inspirational reads from GBYF partners like Mindful Yoga Therapy founder Suzanne Manafort, veterans Sarah Plummer and Sue Lynch, Advisory Board Member Biff Mithoefer and many more…and know that your purchase is helping to bring this transformational practice to more veterans. Starts at $9.95. This is an interview with Kelly Boys, who’s been practicing yoga for most of her adult life, and is a certified hatha yoga instructor. In 2006, she learned of the practice of yoga nidra, and immediately recognized it as a powerful healing tool. That led her to Dr. Richard Miller, a clinical psychologist, who trains teachers in a special form of yoga nidra called Integrative Restoration (iRest). Kelly began training with him, became a certified iRest instructor, and eventually moved to California to help run the Integrative Restoration Institute and work with Richard to train teachers. Along the way, she taught yoga nidra at Walter Reed Army Medical Center in Washington, DC, as part of its Wounded Warriors program, in a residential PTSD and TBI program through the Cincinnati VA, with cancer survivors, those with substance abuse, and in the prisons, teaching both men and women. Currently, she partners with James Fox of the Prison Yoga Project to bring a combined yoga and yoga nidra program into San Quentin State Prison for incarcerated veterans. Rob Schware, GBYF Executive Director: What is iRest Yoga Nidra, and what originally motivated you to bring it to veterans incarcerated in San Quentin State Prison? Kelly Boys: iRest is a meditative practice that is deeply relaxing and restorative, and it provides tools for working with trauma, stress, and chronic pain, among other things. It’s typically taught in savasana, the lying-down pose at the end of the yoga class. It is simultaneously simple and profound, addressing our basic human needs for connection, belonging, and safety; using it, we can gently check in with ourselves. It can be a way for those of us who resist what life brings us to turn and face the truth about ourselves in any given situation. I wanted to help people who have been wounded by war, by their families, and who have in turn wounded others to stop and face themselves, and to give them another way out instead of this punitive system which doesn’t tend to focus on restoration and healing. Having been on the receiving end of domestic violence, it is particularly poignant for me to bring the spirit of forgiveness and healing, along with the ‘sword of truth’ into that setting. This is the sword that cuts through all illusions that we hold about ourselves, and about the world around us. iRest provides such a neat way to get control of our lives by paradoxically letting go of control, and allowing this sword of truth to slice away everything that does not serve us. What is the importance of mindfulness for developing impulse control? How does this help life inside a prison? Mindfulness is a foundational element for impulse control; it allows anyone, anytime, to stop in any given moment and take stock of their own situation, to harness the power of attention and intention in order to see clearly. This moment gives a space for choice and response rather than reaction and violence. One of the vets in our program told us that this class has changed his life by providing him a way to deal with the chaos of life behind bars, leading to a feeling of confidence about going before the boards (which is when they decide if/when he will be released). Otherwise, he would have been reactive and victimized; now he feels calm, and has an inner resource to return to no matter what the board decides about his release. Another vet from the Korean War who is 77 years old said that this class has helped him deal with his lifelong racism toward Asian people, and that his tough, violent shell is getting cracked open. I’m interested in knowing why we should be spending money on providing yoga and meditation to prisoners? 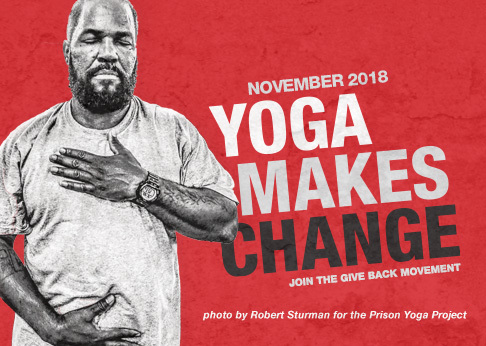 This is an investment that must be made; the transformative effect of yoga and meditation on the prison population is inspiring lasting change. We are beginning to see programs where we connect with the guys on the outside as well, and they are becoming change agents in their own communities. Most of these men will reoffend if we do not offer them another way. Investing in these programs means to invest in the health and safety of our communities.The classes are waitlisted right now because there aren’t enough funds to run programs for everyone seeking to learn yoga and meditation in prison. Let me be clear, though – this is selfish for me! I receive the most benefit from going into San Quentin. It is humbling and fulfilling beyond what I can say to sit with this group of men and get real, speak the truth, guide meditation, and hear the gems of wisdom coming from that circle of folks. Astounding, really. James and I often just shake our heads at how neat it is to teach there together. A complete blessing. What is the greatest challenge for mindfulness classes becoming a regular feature in prisons? As I said, the greatest challenge is funding. I currently donate my time to teach at San Quentin. The CEO at the Search Inside Yourself Leadership Institute, where I work training teachers in a science-based emotional intelligence and mindfulness course, has allowed me to rearrange my schedule so that I volunteer time every Thursday. If we had funding, we definitely have the teachers who want to teach, and we also have a way to train those teachers. That is the number-one need; otherwise, it won’t be sustainable. What advice would you give to anyone who would like to volunteer teaching a weekly class to incarcerated veterans? Do it! Take a course preparing you to work in the prison environment as a way to make sure you are ready for the challenges of that particular venue. Jacques Verduin at Insight-Out and James Fox at Prison Yoga Project both offer trainings for teaching in prison. I would also say, to the extent that you are willing to welcome ALL of yourself, your hopes and joys along with your fear, hate, and the violence you do to yourself, is the extent to which you will be able to teach from a place of equanimity, heart, and truth. This path is a radical one; it asks everything of us. Yoga asks us to take a second look at the idea that we are separate, above, better than, different from, and to let in the thought that just perhaps, underneath all the surface differences, we share the same essence. This is quite inspiring when you really think about it. What organizations do you admire? I love what James is doing at the Prison Yoga Project. He tirelessly travels all over the world training teachers to teach yoga on the ‘inside.’ The Integrative Restoration Institute is doing amazing things bringing iRest out into many underserved populations. Search Inside Yourself Leadership Institute, where I work, is bringing this same work into Google, LinkedIn, Genentech, and many more places. Any organization that practices what it preaches, I admire. For instance, where I work we meditate at the beginning of our meetings, we practice mindful eating, we do the hard job of telling the truth even when it is more convenient to gloss over it, for the sake of finding out what is really real, what wants to emerge in any given moment. There is a trust that happens when a whole organization of people do this. Whether it’s Google or behind prison walls, people are people with the same needs and desires. They are just dressed up differently! Instead of the new Google Glasses, I’d love to give the gift of x-ray vision to anyone that can’t fathom those two worlds being similar. It’s a trip to be able to have a foot in both worlds! I wouldn’t trade it for anything. Would you like to support the transformational work of the Prison Yoga Project? Make a direct donation to support their outreach work, or purchase a copy of James Fox’s book, Prison Yoga Project: A Path for Healing and Recovery, from our online store. The Give Back Yoga Foundation announced this week that it will assume the non-profit operation of Mindful Yoga Therapy for Veterans, a merger that will allow service leaders to more effectively reach tens of thousands of veterans with a complementary therapy that can offer relief from symptoms of post-traumatic stress. Clinical studies and firsthand feedback from veterans show that yoga and mindfulness practices can be an effective adjunct therapy to help vets recover from symptoms of post-traumatic stress, such as insomnia, hyperarousal and feelings of fear or guilt. Together, Mindful Yoga Therapy and the Give Back Yoga Foundation have already brought clinically tested, empirically informed Mindful Yoga Therapy “toolkits” to 44 VA facilities and 9,000 vets, free of charge. Designed with the input of veterans, these multi-media training guides help individuals to start a personal yoga practice. By the close of 2015, the Give Back Yoga Foundation aims to bring these free toolkits to 30,000 vets and at least half of all VA facilities nationwide. The organization also aims to train 120 yoga teachers per year, including at least 25 veterans, to share Mindful Yoga Therapy with the veteran population. These training resources will continue to be offered under the Mindful Yoga Therapy for Veterans brand, through the continued leadership of its experienced staff. Executive Director Rob Schware talks with “Yoga for Heroes” creator Olivia Kvitne for The Huffington Post Blog to learn how she’s introducing the scientifically proven benefits of yoga and meditation to veterans, active duty military and first responders. Read Olivia’s full interview on The Huffington Post Blog to learn what inspired her to share yoga with “real-life heroes,” and her advice for teachers who want to serve in a similar way. Dharma. Service in Action. Sedona Yoga Festival Gives Back. Help us to bring the transformational power of yoga and meditation to 10,000 veterans who are recovering from post-traumatic stress by joining us at the Sedona Yoga Festival on February 6th and 7th for a two-day Mindful Therapeutic Yoga Practices for Veterans pre-conference training. Learn clinically-proven techniques to help students recover from trauma and emotional stress, so you can bring trauma-sensitive yoga back to your community.